Mon, Nov 30 – As we reported, a University of Auckland Professor of hate crime, Scott Poynting, worte an anti-Semitic letter to the Waikato times. 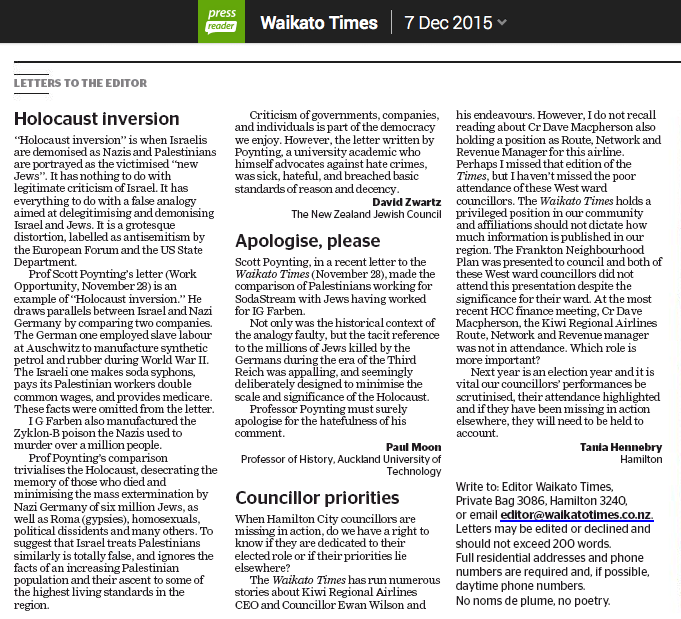 Mon, Dec 07 – The Waikato Times published two letters that call out Professor Poynting’s anti-Semitic note of last week. The first was from the New Zealand Jewish Council, clearly explaining why Poynting’s letter was so hateful. The other was from AUT Professor of History, Paul Moon, who not only pointed out the academic abhorrence of Professor Poynting’s letter but also called for his apology. We hope that Poynting and the University of Auckland will make statements soon and will keep you updated here.